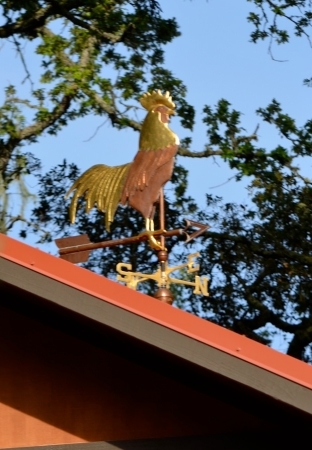 This Chanticleer Rooster with Head facing Forward Weather Vane, Gallus gallus domestics, was crafted in copper with optional gold leafed accents. 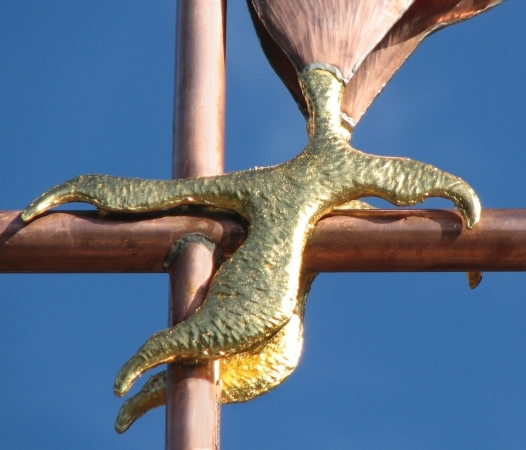 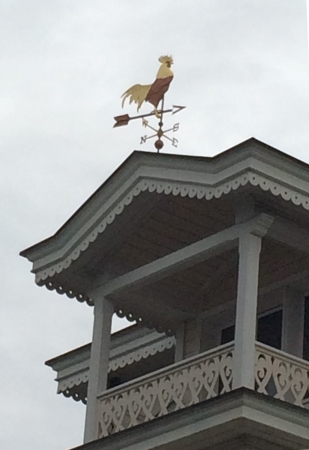 On this particular weathervane we gilded the beak, comb, neck ruff, tail feathers and legs. 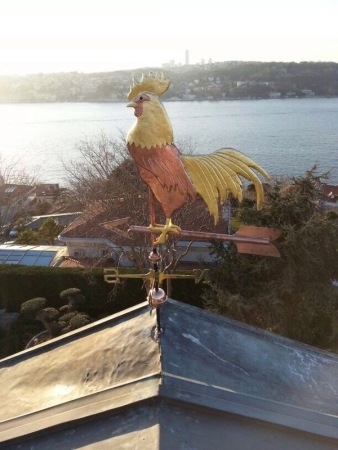 We have made this rooster with red glass eyes and yellow eyes, depending on our customer’s preferences. 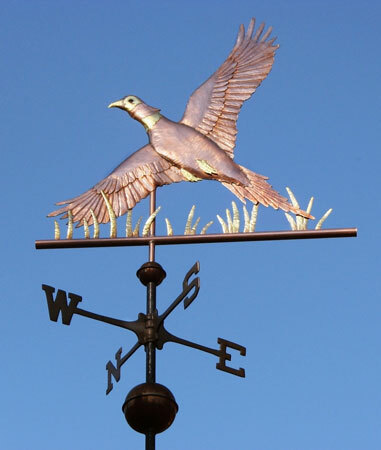 This is a popular and classic design that lends itself to all kinds of interesting locations. 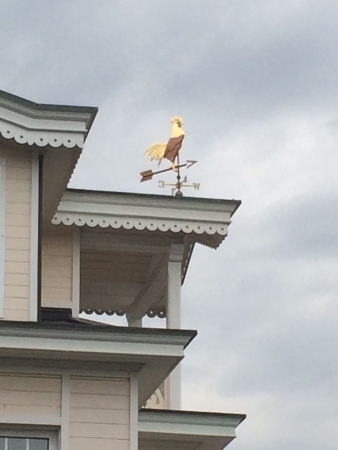 In addition to the roofs of barns and homes, our customers have mounted their weathervane on top of chicken coops, inside a French country kitchen as an example of American Folk Art, perched atop wood sheds, and on top of a new SPCA facility here in California. 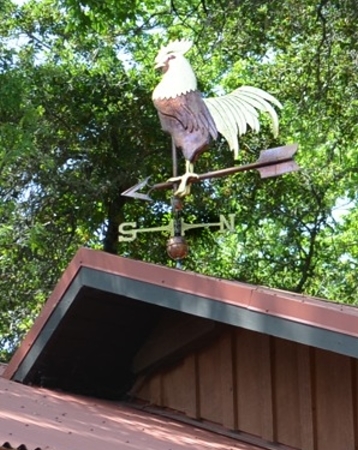 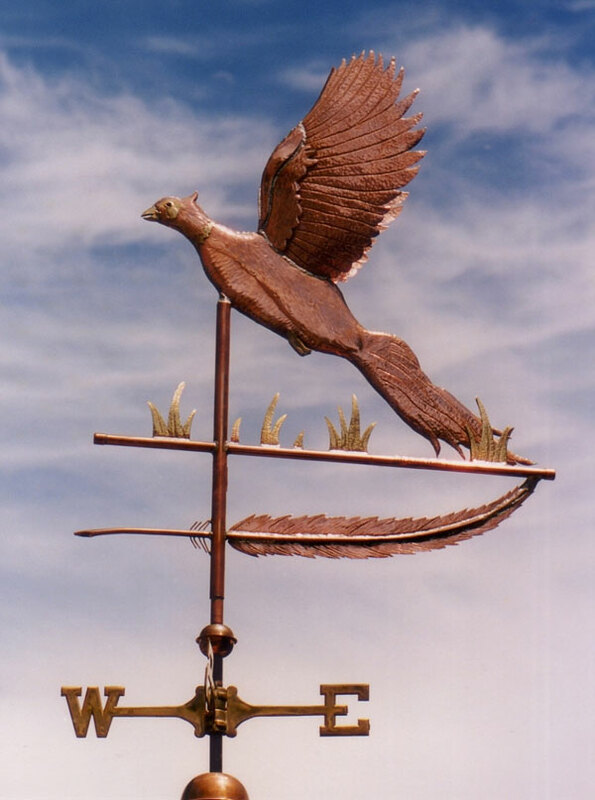 One customer even ordered this weathervane in combination with one of our Fox and Feather Weathervanes, creating an interesting tableau that generated lots of comment. 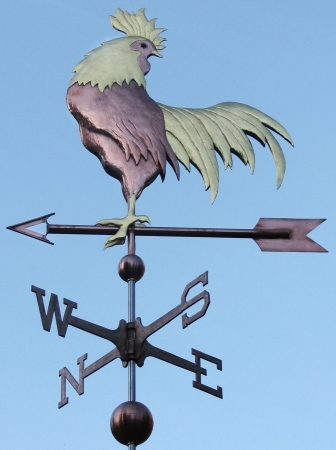 An amusing variation on this design is our Cocktail Rooster. 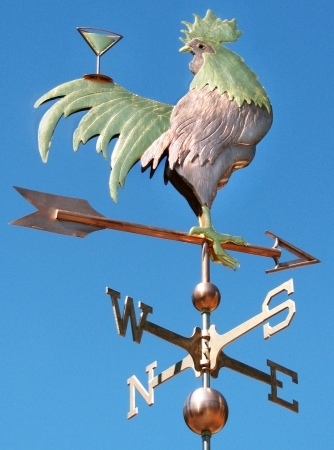 Of course you would be welcome to personalize this vane to add a design element of your choosing. 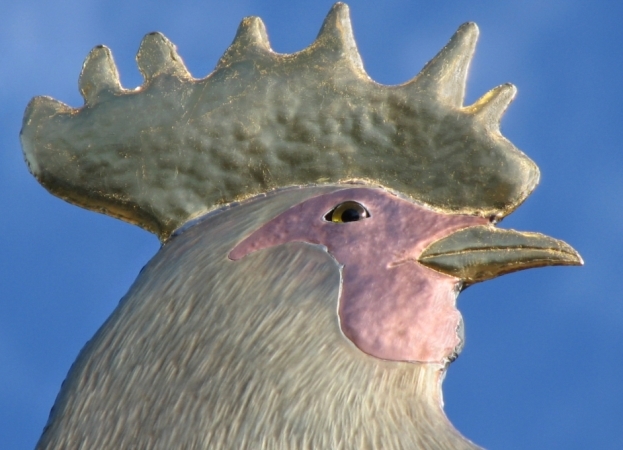 A mouse would be cute, or a butterfly. 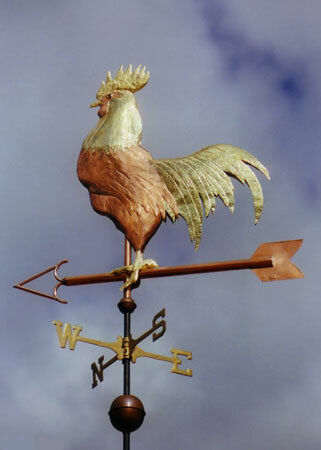 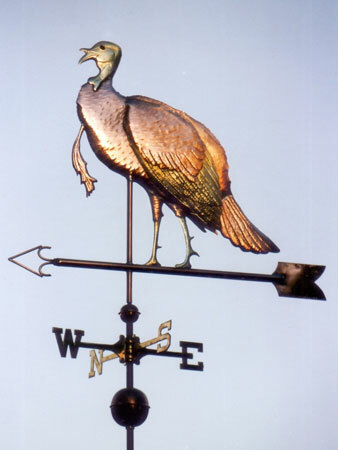 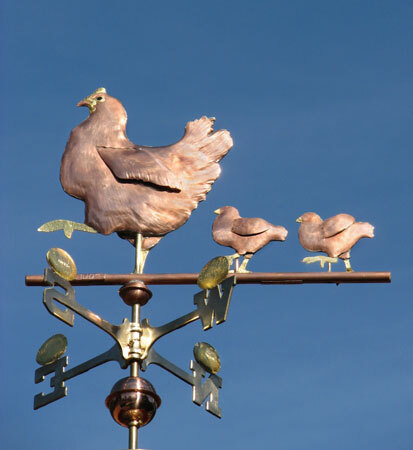 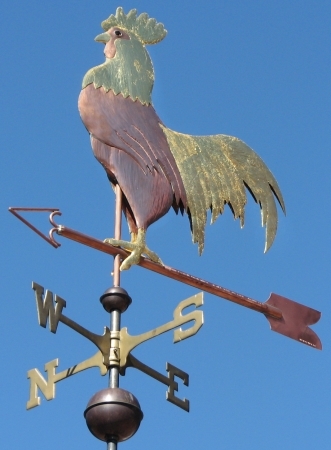 As a symbolic “guard”, the Rooster weathervane is a perfect choice for placing on top of a fence post, barn or home. 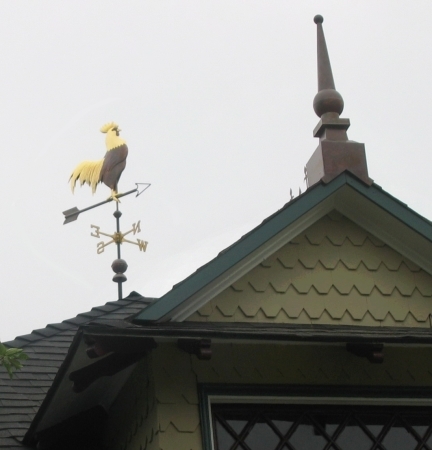 From there, it can quietly keep an eye on things and make sure all remains well in the world. 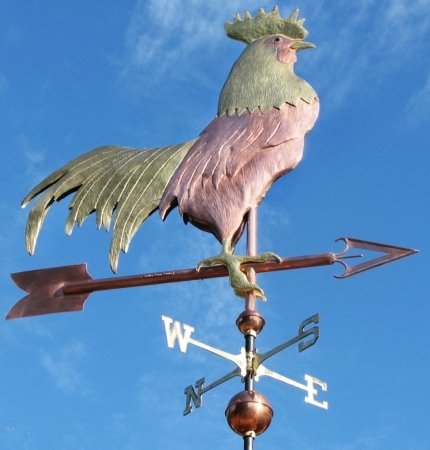 This protective function is one of the reasons why rooster weathervanes have graced the top of structures for over a thousand years. 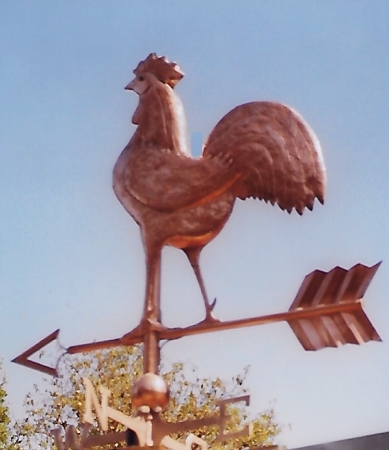 In Europe, you will see numerous examples of cockerel weathervanes in both cities and rural villages, vigilantly surveying their domains. 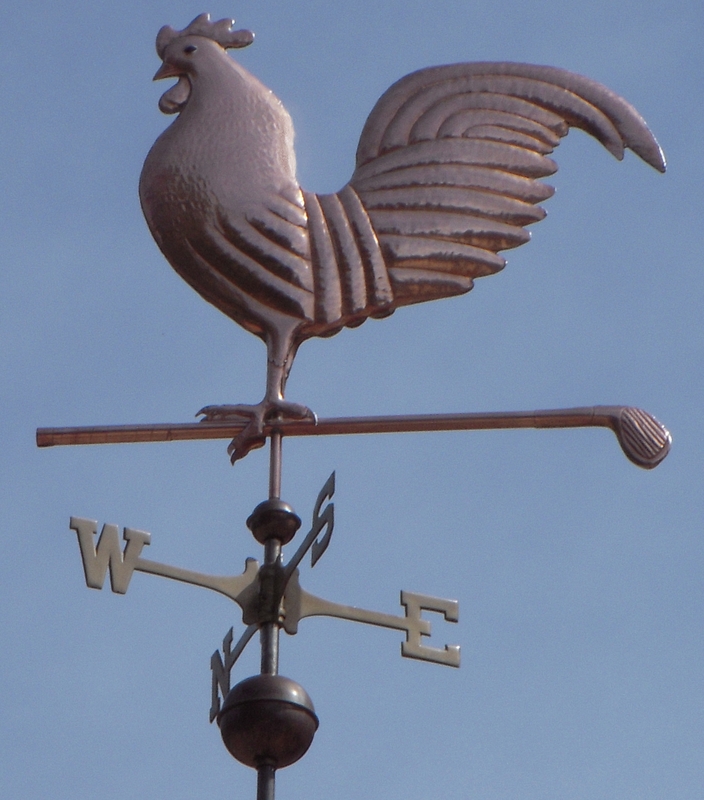 Reflecting on its long history in Europe, we call this particular rooster our Chanticleer Weathervane, chanticleer being the French word for rooster (and ‘sing clear’!). 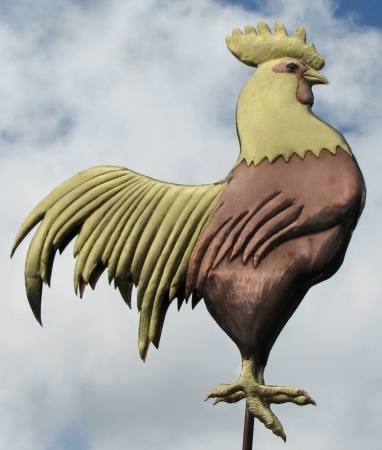 The Rooster is also an important symbol in the Chinese Zodiac, representing the birth years of 1933, 1945, 1957, 1969, 1981, 1993, 2005 and 2017.